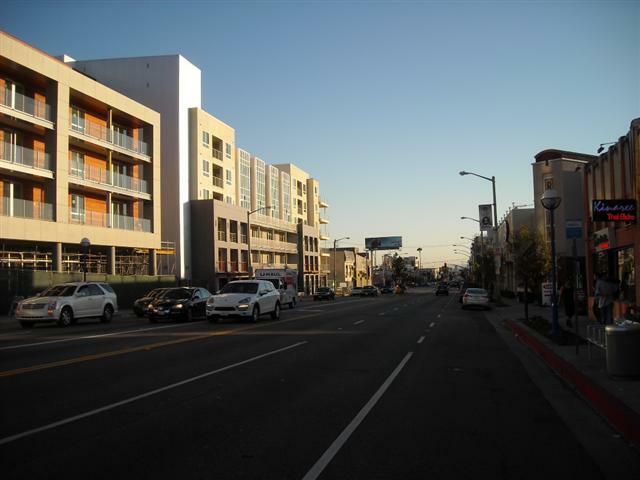 Last year, the city of West Hollywood completed planning for the La Brea Streetscape Project. This ambitious plan includes “design, installation and construction of streetscape improvements to a .375 mile segment of La Brea Avenue in West Hollywood,” as quoted from Metro’s The Source. In addition, the project promised to transform La Brea into a “more complete street that can support more alternative modes of transit”. This year, the plan started to be put into place. But while La Brea has certainly made a shift towards a “complete street” concept, the goal was still not reached; it seems that the city forgot about bicyclists and didn’t do enough for pedestrians. Several small center-median islands have been built on some portions of the corridor. Those were noticeable improvements, and we shall thank the city of West Hollywood for them. However, that’s where the project positives come to a screeching halt. Walking along La Brea is still not appealing, bicycling is outright dangerous, and in the early months since the project was completed, transit usage has not increased. Sidewalks: Although repaired and are safer to walk on, sidewalks remain uninviting, due to their naked utilitarian concrete pavement. For example, the Santa Monica & La Brea shopping center – with Best Buy, Target, etc. – offers better walkability. The large plaza, along with sidewalks around the shopping center, has attractive, decorative pavement, with trees and planters. I contacted a West Hollywood representative regarding naked concrete sidewalks on La Brea, but he got overly defensive in response. I then diplomatically explained to him about certain urban guidelines. Plain concrete sidewalks do not attract pedestrians as decorative sidewalks (combined with landscaping) would. At the end, this representative admitted that the cost and complexity of replacing underground utilities are the main reasons why La Brea sidewalks did not get properly paved with decorative covering. Streetlights: While the blue “decorative streetlights” were installed – to match the ones on Santa Monica Blvd. – they provide little-to-no improved aesthetics. The new streetlights are too nondescript to truly make a difference. Beautiful historic streetlights were installed on some streets in Hollywood; perhaps WeHo could use the same for La Brea. 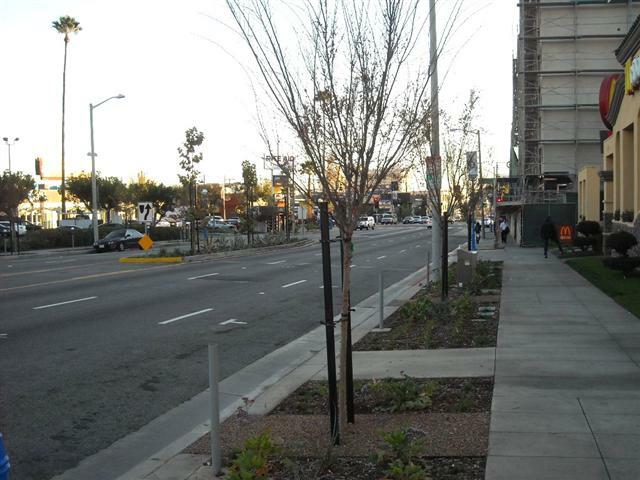 Trees: WeHo did a great job planting deciduous, drought-resistant trees. In some segments more trees could be planted, to fill-in the gaps. Buffer Zone and Greenery: This is another area that did not get proper attention. Along the project area there is a new lawn with mostly fresh dirt, but not enough greenery and not a single planter. To compare, the newly completed Fountain & La Brea mixed-use building offers a wider buffer zone with plenty of grass and planters. In fact, it’s mostly the mixed-use development is why La Brea now looks better than ever before. Center-Median Islands: The very short islands provide little-to-no improvement. True, having short islands is better than none at all, but they could have been much larger. The nearby Highland Avenue, for example, has gone through a much more dramatic transformation thanks to much longer and wider center-medians. City of WeHo claims they tried to accommodate left-turn pocket lanes. However, in reality the number of cars using left-turn pockets is insignificant to justify very short center islands. Some of the “precious” left-turn car space could, after all, be sacrificed to lengthening the center-median islands – to improve streetscape on La Brea. Bicycle Facilities: This is where City of West Hollywood deserves a 5-star Failure rating! Not a single bicycle facility has been provided for the entire La Brea Streetscape project. WeHo simply ignored all the pleas and requests from the public, and provided zero Bike Lanes, or even Sharrows. As far as bike parking, I only saw one (!) new rack installed – that’s for the entire project. Other Modes of Transit: The plan openly stated to include “more alternative modes of transit”, however nothing of this sort was done. All bus stops and other amenities remain the same. La Brea Avenue remains primarily a car-obsessed corridor, just as it always did. Complete Street (or Not): The existing 6 lanes on La Brea should have even been reduced to 4 lanes. This would accommodate: (a) wider center-median with plenty of trees & greenery, (b) wider sidewalks and buffer zone, and (c) Class II bike lanes. This change would have made La Brea a truly “Complete Street”. Sadly, none of this has materialized. La Brea remains a dangerous 6-lane highway with no room for safe bicycling, and barely any improvements for pedestrians. 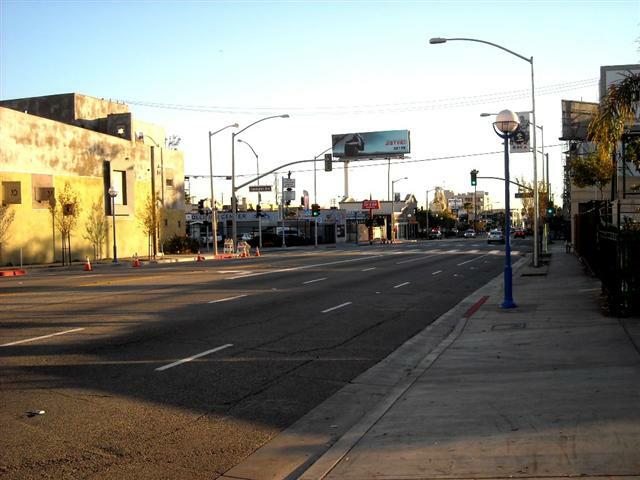 La Brea Streetscape project did improve the appearance of the boulevard, but many aspects have been neglected. The project was obviously completed on a low budget and tight schedule. 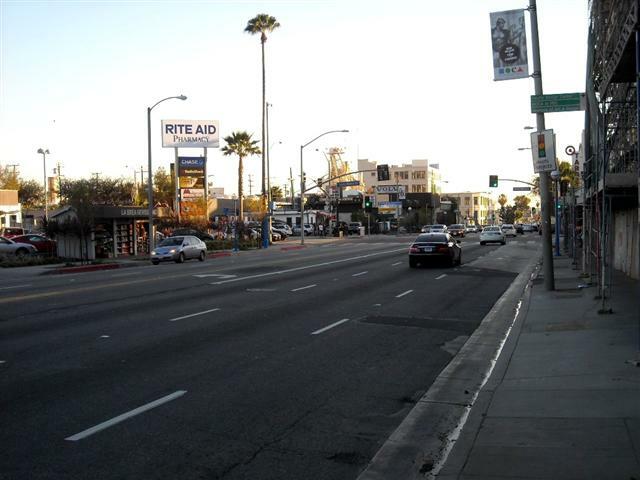 Much more could have been done – to improve the appearance and quality of life along La Brea Avenue. Unfortunately, City of WeHo demonstrated its car-only mentality, with barely any improvement for pedestrians, transit users, and especially bicyclists. Thankfully, two large La Brea mixed-use developments – one at Fountain, and the other at Santa Monica Blvd – have significantly beautified the area. The nearly-completed buildings look beautiful, modern, and even have some architectural appeal (more could be added, though). Increased density, combined with better walkability and safer environment – should play a positive role for the area. Quality of life is all but certain to improve. Now, let’s refer to some photos that I recently took to show how La Brea has improved and can be further improved. La Brea Avenue southbound. just south of Fountain Avenue: Thanks to the new mixed-use project, the street looks more inviting. 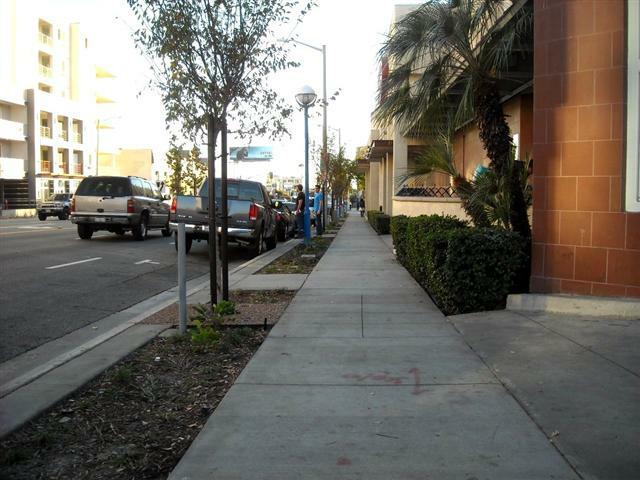 However, center-median is barely visible, and sidewalks have not been widened by the city of WeHo. 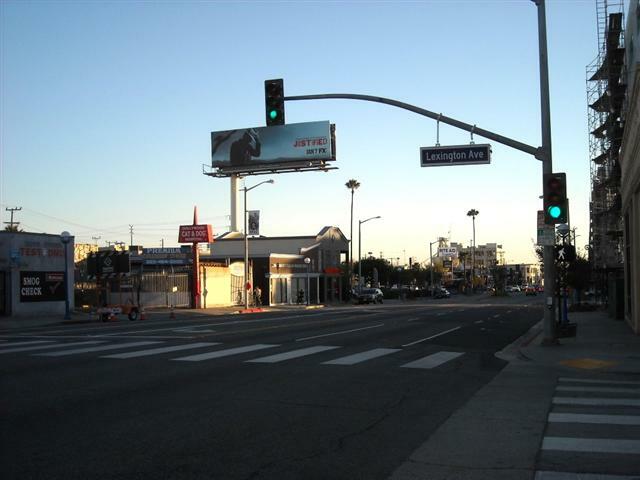 La Brea Avenue, looking north: Same gloomy, nondescript concrete sidewalks. Where is decorative pavement that better attracts pedestrian life? Where is a more distinct buffer zone? This type of “streetscape” is not too encouraging. La Brea Avenue, looking south: same gloomy sidewalk. Nondescript trees albeit drought-resistant. Landscaping barely improved. La Brea Avenue, looking south: A minuscule center-median, between Fountain and Lexington Ave. This center island should have been much longer. La Brea Avenue at Lexington: Quite an ugly area. Again, no center-median island. Naked concrete sidewalk. No buffer zone or trees on this segment. La Brea Avenue at Lexington: another gloomy piece of La Brea. No center-median island. Naked concrete sidewalk. Thankfully a “zebra” crosswalk has been painted. La Brea Avenue, between Santa Monica Blvd and Lexington: finally, a small center-median appears, but still we are facing that same ugly naked sidewalk, with no decent pavement or other pedestrian-friendly features. La Brea Avenue, just north of Santa Monica Blvd: no more center-median, unfortunately. Nondescript, unattractive street. Just a typical car-crazed street. What a missed opportunity by city of West Hollywood! 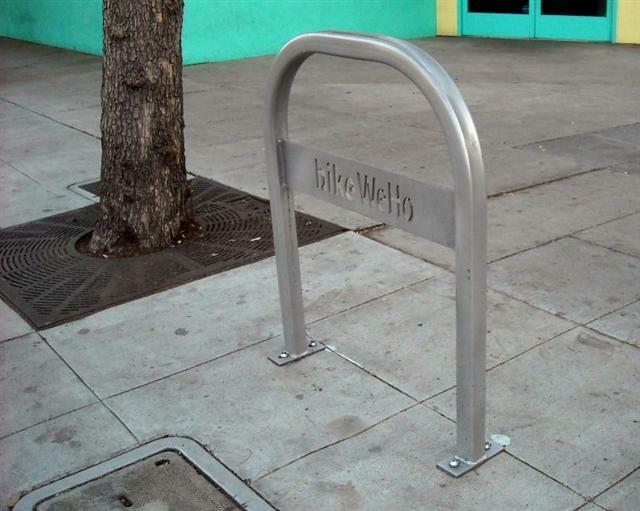 Bike rack on Santa Monica Blvd: Bike racks were installed in other parts of West Hollywood, but only one on La Brea. Thankfully, the Santa Monica and La Brea shopping center does have bike parking. Now, let’s take a look at other examples. Recently I visited New Orleans, LA, and was amazed at the city’s walkability! Below you can find examples of how beautiful the streets, and sidewalks, can look when truly pedestrian-friendly streetscapes are installed. This can be a good lesson for city of WeHo. 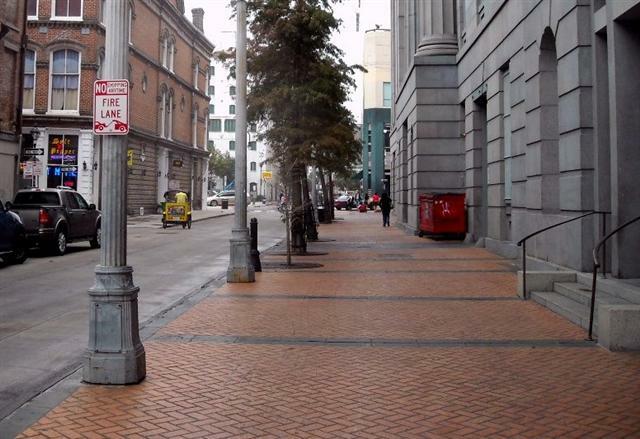 Downtown New Orleans: pedestrian-friendly sidewalks of New Orleans. Downtown New Orleans: great example of sidewalk decorative pavement. 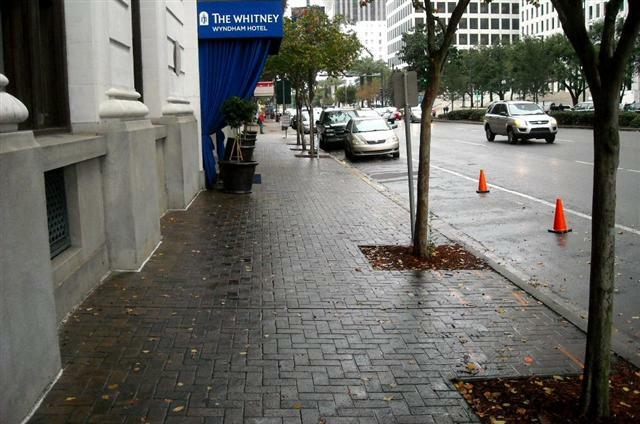 Downtown New Orleans: another pedestrian-friendly sidewalk. 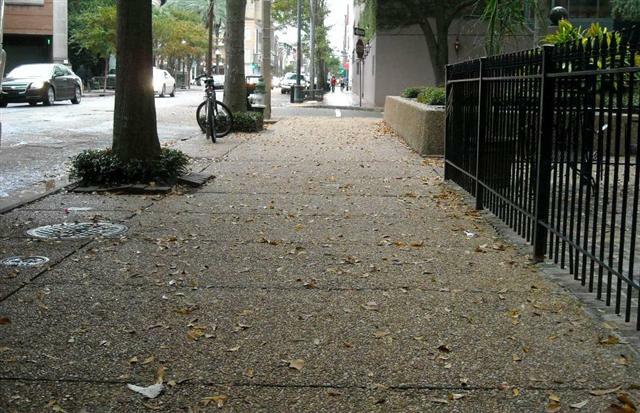 Downtown New Orleans: another type of pedestrian-friendly sidewalk pavement, combined with trees. Downtown New Orleans: classic example of pedestrian-friendly and aesthetically correct urban sidewalks. Something that the city of West Hollywood completely disregards. 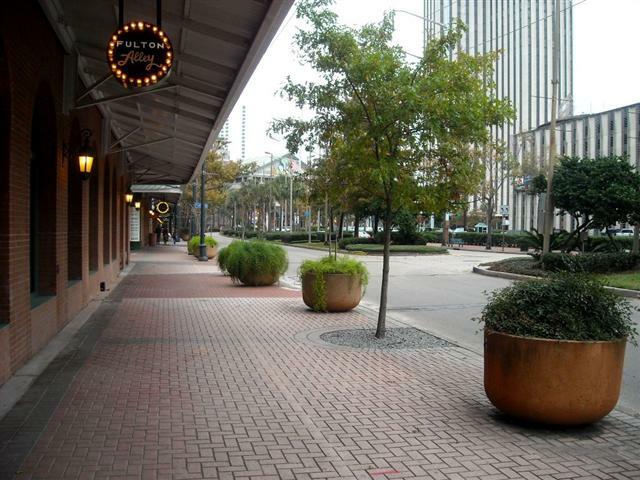 Downtown New Orleans: more examples of pedestrian-oriented streets. Those types of sidewalks are popularly used all over the U.S. and other parts of the world, especially Europe. 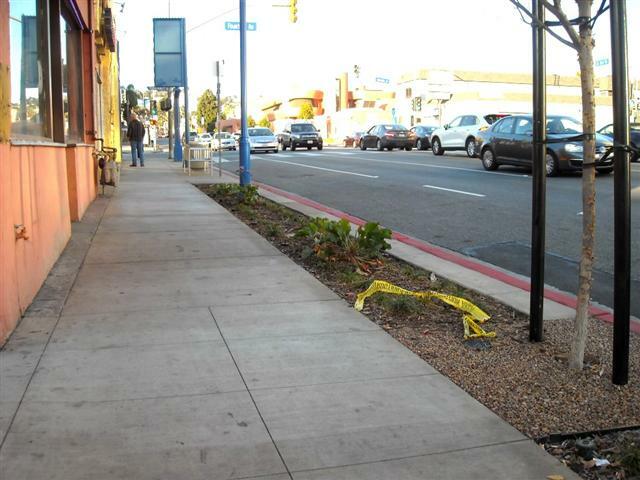 Los Angeles County continues its car-oriented mentality with naked ugly concrete sidewalks. To summarize: L.A. County in general, and West Hollywood in particular, have yet to learn from other cities in the U.S. (let alone other countries) what proper urban design truly is, and what street aesthetics are about. La Brea Avenue offers anything but proper urban design. True, vastly propagated “car culture” has taken away walkability and streetscape. Nevertheless, our cities should attempt to reinstate our pedestrian infrastructure and provide the most essential urban design guidelines, as it is done in the rest of the world. Unfortunately, our city officials continue to let things drift on their own, leaving it up to the private developers to beautify selected street segments. Hence our city streetscape is improving at a snail’s pace. Thankfully, most large projects do include street beautification and transformation; both La Brea mixed-use projects are a good example. I still hope, pedestrian features (better sidewalks, more trees and planters, and a wider buffer zone) and bicycle infrastructure (bike lanes and plenty of bike parking) will be added to La Brea and other major corridors in the near future. It’s time for our local governments to embrace sustainability, and to provide streets for everyone, not just for cars. After all, that’s the reason the “Complete Streets” act was approved. Good analysis. I would suggest refraining from referencing other cities in posts like this, however. City officials will just respond, “that’s not Los Angeles”. It’s not necessary, there are plenty of good examples of pedestrian-friendly streetscapes in Los Angeles, even in WeHo in particular (Santa Monica Boulevard). I’d like to nominate the full length of La Brea as a prime candidate for a “Grand Boulevards” type transformation. La Brea as a complete street/BRT route would tie together numerous dense walkable corridors including Hollywood and Sunset Boulevards in Hollywood, Santa Monica Blvd. in We Ho, Miracle Mile and the Baldwin Village Area in L.A., and Main Street in Inglewood in addition to intersecting with five rail lines (Red, Purple, Expo, Crenshaw and Green). As a complete street, the dreamer in me would say install a protected bike lane the who way up as well! Assuming that the Crenshaw Line eventually gets extended up San Vicente and then Santa Monica Boulevards to Hollywood and Highland, that would give La Brea a sixth rail connection, and you would then have three major north/south mid-city routes: La Cienega (cars), La Brea (bus/bike), and Crenshaw/San Vicente/Santa Monica (rail). This point underscores why MyFig will be so important. 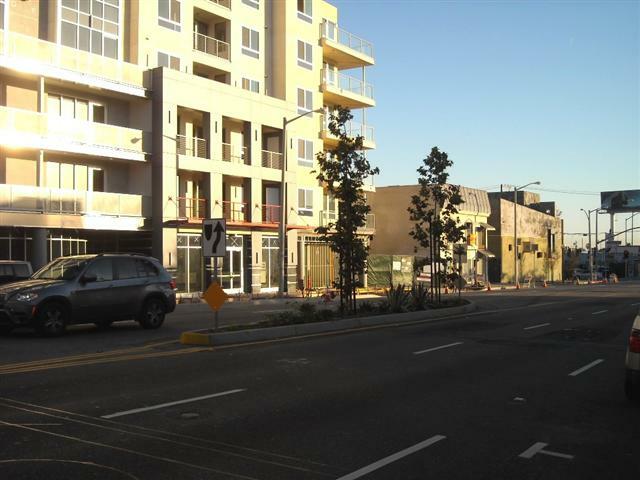 It’s just one stretch of one street, but it will demonstrate what the gold standard looks like in the LA region and show half-baked measures like this one in WeHo for what they are. Kudos to the author for a good, thorough analysis. Agree 100%. And La Brea would be an excellent BRT candidate, although I don’t think it’s high up on the list at LADOT or LA Metro. For all the new development going up on La Brea, this is a major corridor that cannot just absorb all of these folks driving. It needs BRT and some significant additional accommodation for bikes and pedestrians. Sadly, this WeHo segment does feel like a missed opportunity. Perhaps it’ll galvanize people in the area to press for more? Blessing in disguise? I hope so. I agree that walkability is important, but I don’t think prettiness of the walkway is as important as there being destinations along the route. 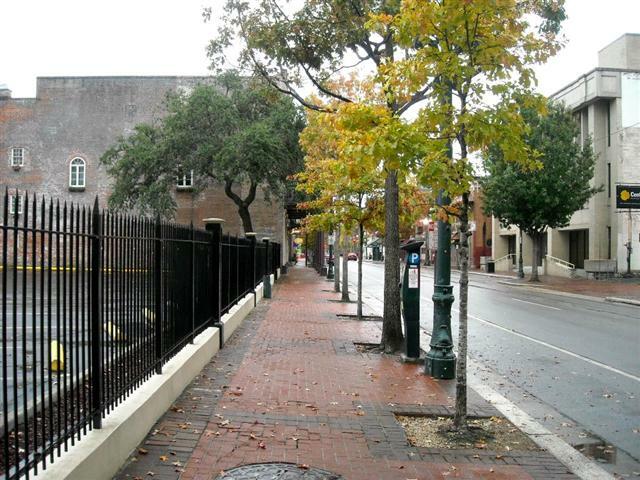 While New Orleans has nice walkways, there appear to be almost no pedestrians in the pictures. The city should definitely do more to develop alternative transportation (both bicycles and transit) along the corridor. The aesthetic quality of the sidewalks is less important than the ability to safely cross the street and do so without having to make a major detour to find a marked and light protected crosswalk. What I remember about my one day spend walking around this area (a mistake I will never make again) is that planners and traffic engineers don’t quite understand that people sometimes need to cross the street. 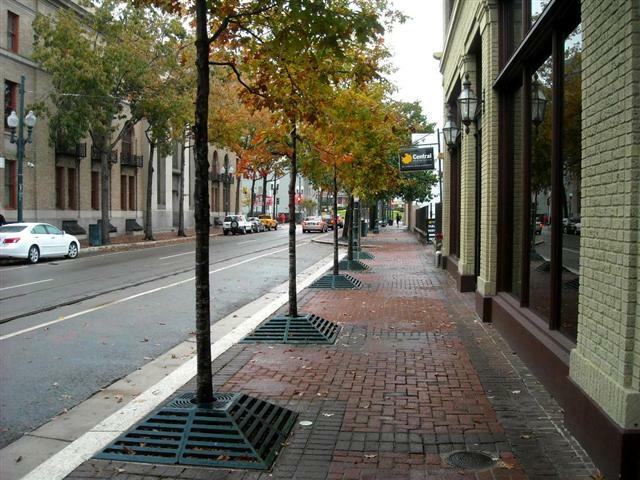 Planting a few trees in a median is an insult to anyone unlucky enough to walk in this city. Your life is of no real value to us but hey, look at the pretty tree. Is median landscaping supposed to make driving more pleasant and if it does might it not contribute to inattentiveness of the part of motorists? Part of the problem with the bike facilities and 6 lane width is that this street only has a short segment in West Hollywood, sandwiched between two longer segments in Los Angeles. Neither city will fix their part without a commitment from the other to join in. But they’re also not going to wait for the other city to move. So it will languish for a long time. Alex, I’d like to thank you for adding the importance of aesthetics. I know of lot of women who won’t “walk in LA” because the streets look like they have been urinated on, they have gum residue on the sidewalk, and walking down the street doesn’t feel pleasant. For women a street has to have appeal. It has to feel good to go for a walk. I like it when my eyes are drawn to pretty things, instead of just seeing dust and dirt down the street. I like to be inspired when I go outside to run errands. I like to feel safe from traffic, elements, and shady people, when I go outside. So I think it is very important to consider aesthetics in any street design, to make it appealing people of all walks of life. What now for the West Hollywood Transit Corridor? At Councilmember Ryu's community input meeting on safety improvements for Sixth Street, two options were presented: more left turn pockets, or a road diet.